Last month I was fortunate to visit Amsterdam for a very brief trip. Whenever I visit a new city I like to see if there are any interesting stationery shops that I should carve out some time to visit. (Small helpful hint: check out All Things Stationery’s handy map.) 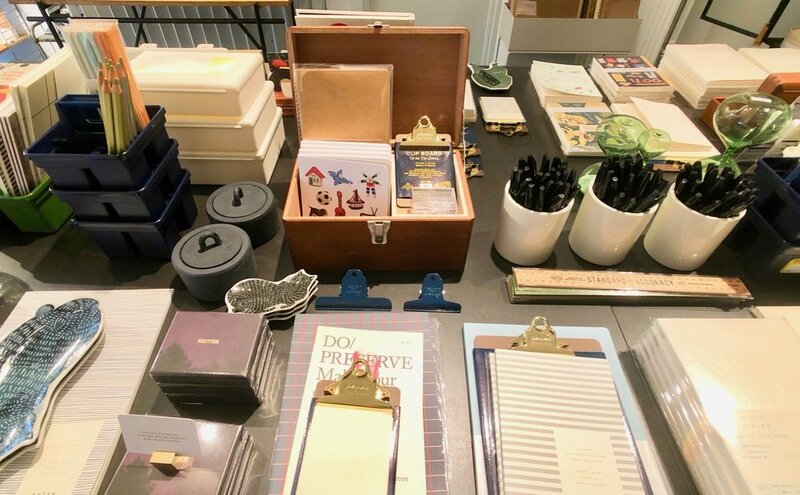 My recent trip to Amsterdam was no different and I found an afternoon to visit two stationery shops, my thoughts on which are shared below. My first stop was at Like Stationery, a short walk from Amsterdam Central station. I wasn’t overly familiar with this shop before my trip but their website looked really nice and their instagram well shot, so I was hoping this would be a little gem. But when I arrived it was quiet, and dare I say a little unwelcoming. There were also quite a few notices asking for no photography. Like Stationery had a good range of brands in store displayed and presented really well. A long central table held lots of different notebook brands such as Life Stationery, there were tall glasses filled with Blackwing pencils and a display of correspondence cards. The selection that Like had was pretty good and everything was laid out allowing you to see what was on offer. The one downside was a lack of testing pads alongside the pencil and pen displays, and when combined with notices of no photography it creates an atmosphere of no play. I didn't buy anything from the store for some of the aforementioned reasons, but also because there was nothing there that really grabbed my attention. My second visit of the day and the shop I was really looking forward to visiting was Misc. It was a little bit of a walk out of the city and even in the cold and wet weather I wasn’t deterred. Misc has lots of treasures displayed in a manner which made them easy to look at and in some cases test and play with. There was a small Travelers Company section in the store which I was immediately drawn towards. Misc had some beautifully worn TN’s on display to give you an idea of how the weather wears and ages, to show how they can be set up and used. It’s such a great idea to include them in this manner because part of the allure is how these notebooks change with use. There were also some Travelers Company stamps with an ink pad, that I happily played with and added into my own TN. Another brand I was keen to see in Misc was their range of Classiky items. I haven’t noticed too many online stores in Europe where you can find Classiky and I had only seen some in person at Present and Correct in London. Misc had a great selection including the small dishes, the wooden first aid boxes and some of the papers and pads too. Misc did have a pen testing area in one section of their shop. An array of pens and fountain pens from brands such as Lamy and Y Studio were displayed with testing pads encouraging you to try them out. I did have a little play in this section too, in particular with the Y Studio pens as I hadn’t seen these in flesh. I spent quite a bit of my time exploring the different stationery items that Misc offered and chatting to the staff. I came away with a small selection of items including an Olive TN, a set of the Midori pencils and a Le Typographe Porte-Mine mechanical pencil. I bought this mechanical pencil after testing it out and because I was surprised by how comfortable it was to use and how nice the graphite appeared on the page. Letting customers play and test definitely helps them to buy - no question. Misc lived up to my expectations and I really could have spent a lot of money there. I think on another trip to Amsterdam I would definitely take the time to visit again. As a customer you’re encouraged to try and test things out, which was very different from my experience at Life Stationery. As usual I thoroughly enjoyed visiting some of the stationery shops during my trip. It’s a great way to find new products you may not normally be interested in, or exposed to. With a bit of good fortune I should be able to get back out to Amsterdam this year and will take the time to visit other stores too. One last thing before you go…below was my short break stationery toolkit. Far too much as always, but it included the things I thought I needed. This needs a lot of refinement and is something I have to work on but I thought I would share it with you. I’ve reviewed my 2018 planners and explained what I have lined up for 2019 in my recent posts and this got me thinking about all the tools I have used this year. 2018 feels like a year of consolidation. I’ve acquired less stationery and tried to focus on using what I have stored in my drawers and cupboards. Today’s post is reflective and about sharing my year in stationery. I use a lot of paper and I always feel like I have too much paper on the go. I enjoy trying out new notebooks and paper stock but I also like what I like. Baron Fig notebooks have become a staple in 2018. I use one Baron Fig Confidant as a journal, at the moment this happens to be the big Fig, or the Baron Fig Plus (small side note, I really wish Baron Fig had called this the big Fig). I also use one of the Confidants or the Vanguards for work because the paper works so well with pencils, ballpoint or rollerballs as well as fountain pens. I like that I don't have to consider my writing tools at work. I thoroughly enjoy using the Travelers Company notebooks. Their paper is high quality and is perfect for pairing with fountain pens. I enjoy the cream paper, which is not to everyone's taste. That is supposed to look like an ‘18’. I have used a lot of Field Notes notebooks this year but this is because I have a lot to get through and not because I am a super fan. My love of Field Notes has waned over recent years. I buy what I like, the Coastal edition was a favourite of mine this year, but I am no longer concerned with acquiring any notebook that they release. Finally my exploration into sketchbooks has expanded my experience with paper. Finding what I like to sketch on, what paper works best with watercolour and coloured pencils has all been part of the journey. Currently I am using a pocket Baron Fig Confidant as I am mainly sketching with pencil and black pen and I was interested to see how I fared with a small sketchbook. I think as I go into 2019 I will only increase my knowledge in my sketching materials and really find what works well for me. 2018, the year of pencils? My pencil use has increased a lot in recent months. I use these mostly with my pocket notebooks for daily note taking but there is also sketching use in there too. I tend to use one pencil for a while and then rotate when I fancy a change. Lately I have been really enjoying the Tombow Mono 100 2B. The softer graphite is not usually a pencil I am drawn to but this pencil is so smooth to write with. I have loved using the Blackwing 54 in part because of the colour choices with this pencil and the hard graphite that makes it a great note taking pencil. The Craft Design Technology pencil has been another favourite. The mint coloured barrel is just beautiful. And finally the Staedtler Mars Lumograph in H, I love this pencil for its simplicity and its ability to hold a point. It’s an old reliable. This is one category where I’m happy with what I’m using. Unusually, I don't feel a pull to acquire more pens or inks and find joy in using the pens I have. The Lamy LX with Sailor Blue Black is my go to fountain pen. I have been using this combination for most of the year, it just works. The Pelikan M400 and Sailor Wagu-Uguisu is a great match. The gold nib, and the softness when writing means I get a good view of the green Sailor ink and can appreciate the shading. It’s so much fun writing with this pen and I usually admire my scrawl once complete. Finally the Kaweco ART Sport inked with Pilot Iroshizuku Ina-Ho. I love this combination as the colours work so well together. The final category that I felt was worth a mention was drawing pens. In my effort to learn how to draw, drawing pens have been vital tool that I now use more than I ever have. They are so versatile and useful to have as part of any stationery nerds toolkit, but for drawing they are a dream. I have used fine tip drawing pens and brush pens to experiment. The Tombow brush pen has been a personal favourite and the Faber-Castell PITT Artist pen continues to be my preferred sketching pen. Recently I have tried a Pentel marker and the Pilot Finerliner to experiment with line width. My tools of choice have changed a bit this year which is down to a shift in the way I use my analogue tools. I used to be fully immersed in fountain pens and ink and couldn't get enough, but now I happily use other tools alongside my fountain pens. They all have a certain purpose. I’ve been most surprised by how much I have used pencils and that’s in part as I am sketching more now, but also because they’re so easy to use with a pocket notebook. It makes my daily carry easy. 2018 has been less about acquiring new things, although I have done a bit of that, but more about finding what I like and using it more and more. In 2019 I want to continue this and really hone down the tools I enjoy using. Finally I would like to say a big thank you to everyone who reads, shares, likes and comments on my posts. I really enjoy sharing my thoughts on stationery and hope you enjoy the content. I'm looking forward to sharing even more in 2019! At the end of each year I like to reflect on the planners I have used and how I have been using them. I share the planners I have set-up for the coming year but I think it’s important to also review the past year and what has worked well. In today’s post I will run through all the planners (yes plural) that I had planned to use this year and run through what worked and what didn’t. If you’re interested in reading the 2018 Planner Plans post you can find that here. The Jibun Techo was new to me for 2018. I had never used it before and I was so eager to get my hands on this planner I had to buy from the US and important it, taking the hit on customs. It was a worthwhile decision because it’s been my most used planner in 2018. I wrote a full review of this planner and created a video walk through which you can see here. But to touch on some of the highlights of this planner the paper quality is excellent. It has a version of tomoe river paper which means the pages are super thin and handle fountain pen and inks really well. I recorded a small clip of the sound the almost full planner makes, a stationery nerds dream. The weekly layouts are brilliant and hold a huge amount of information. It’s actually very impressive that they’re able to craft that much space out of the page. Over the course of the year I made small adjustments with how I used these pages, but mostly I’ve stuck to my original review. And then what really makes the Jibun Techo that little bit extra special is the extras. The pages at the front of the planner that let you record the books you’ve read, the movies watched and a few extras I didn’t use are all really useful. With one of the monthly overview pages I used it as my Habit Tracker. Having all of this stuff in one planner was not something I’d been able to do before, so the Jibun Techo was unique in that way. There is a lot to like about this planner and for list makers and memory keepers it’s excellent. I have been a Hobonichi user for a few years. The first year I used a Hobonichi Techo is was the English A6 size and it was a sort of journal. But I found that it overlapped a lot with how I used my Travelers Company refill so with my next Techo I switched it up, and then I guess lost my way with it. This year I bought a Hobonichi Techo Cousin but I couldn’t find a way to use it. I tried several different set-ups including a bullet journal, a health tracker and a goal planner but nothing stuck. Unfortunately for most of the year the Cousin went unused. This was my first Hobonichi Weeks and I bought it as I was already ordering from Hobonichi and the design was so damn cool. I was attracted to the slim size and thought I would use it as a functional diary which is how I started out, but this didn’t last very long and I just forgot about it. Pre-empting my 2019 plans I wanted to give the Hobonichi Weeks another run. In October I started using this to track my ailments (I seem to have a lot these days). Headaches and their severity, eczema outbreaks, physio progression and so on. I wanted to know what I felt and when over a period of time so I could link this back to the environment, place or circumstances that may have been aggravating these things. This did work out quite well but did mean I wasn't using it consistently each day. I wasn’t sure this was the best way to use one sole planner so I went again. In the past couple of weeks I have started using this as a diary again. Working out my week in the day sections, figuring out where everyone in the family is and what’s going on. On the right hand page I’ve been noting down the big things I need to get done that week. In the run up to Christmas this has been really helpful. This has been a constant notebook I have used for years now and I love this refill. My use over this time hasn’t changed either. I record small snippets of my day and decorate the pages. Nothing practical, no times, purely things that I experienced on that day. I went into this year with too much. I always do this, but this year it wasn't manageable and as a result I didn't use some of these planners. I hate being wasteful like this, but it has influenced my decisions about 2019. The Jibun Techo has been a great planner for 2018 and it’s almost become a form of analogue time tracker. It’s enabled me to see how I spend my personal time and the things I achieve each week. Next week I will be sharing my 2019 planner plans. I have most of the items already and I will share with you what they are and what attracted me to these planners. 2018 has been a year of personal change and as a result what I need from my planners has changed too. Baum-Kuchen shared an excellent post on choosing your planner and the evolution of their planners. If you didn’t see this check it out here, it really got me thinking about what and how I use my planners.